To that end, since 2006 we’ve shared annual normative data with our clients to help answer the question: “Are our results good?” The reports include results for over 20 RM programs, which provide benchmarks for engagement specific to the healthcare industry. We have observed a distinct difference in the Oncology space from RM program results in Specialty Care, and have since delineated our reporting to continue tracking the differences. At a high level, Oncology programs have the highest engagement levels, likely driven by urgency for information. Interestingly, Oncology patients/caregivers are tougher to identify and lead to RM enrollment—we have found that they are more discerning about programs that require sign-up, but once in, they are engaged twice as much as compared to Specialty Care programs. Fact: Metrics can be predicted. 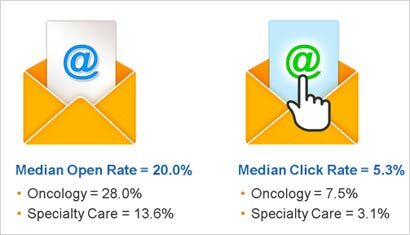 There is a strong correlation between email engagement, disease state and media investment. Action: Determine quantitative goals up front and establish an appropriate media plan based on your category and competitive set. Fact: People don’t wait to open emails—Smartphone use makes it easy to check emails any time of the day. Forty-seven percent of opens occur within 12 hours, and 69% of opens occur within 24 hours of deployment. Eighty-six percent of opens occur within three days of deployment. Action: Time email deployment strategically to coincide with the patient journey and important treatment milestones. For example, emails can be timed to coincide with important events such as doctor appointments, a scheduled infusion, or a diagnostic anniversary. 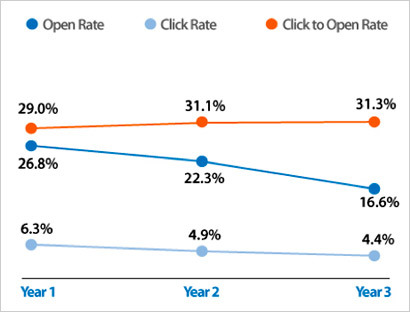 Fact: Open and click rates moderate over time: Multi-year programs are prone to engagement decline due to campaign fatigue and changes in market dynamics. Action: Subject lines, content and value propositions must be refreshed on a regular basis. Also consider content delivery that is based on user preferences. For example, introduce “pull topics” into your email strategy to allow recipients to tailor content to their immediate needs. Fact: Non-co-registration enrollments have open and click rates that are over 2.5x higher than leads from co-reg sources. Media source has a significant effect on engagement at the program level. Co-reg sources bring in a high volume of enrollees in desired segments at low cost; however, leads from these sources generally have lower levels of engagement. Co-reg rates are much stronger for Oncology vs. Specialty Care due to more specific parameters used for pre-screening patients. Note: This is not intended to disparage the importance or effectiveness of co-reg driven programs. It is our position that co-reg can be a very effective driver of large quantities of leads at efficient costs per enrollment. Often, the resulting “cost per action” (cost per enrollment divided by total opens and clicks per enrollment) is lower than that of other media sources. Action: Benchmark metrics are useful to set expectations for engagement based on the media mix that is in place for the program. Program goals should be set based on an analysis of various factors including: condition, patient population and media mix. What are the quantitative objectives of this program? And, do I have a clear ROI model that considers the fully burdened costs of the program build and media against measured results? What are the category nuances that may affect response rates? What can I compare my results to? Is there a similar program within our organization, and can I gain access to a normative study within the healthcare space so that I’m comparing apples to apples? At the end of the day, a “good” program meets the goals set forth at the start, and takes into consideration the special nuances of your category and associated behavioral trends.